It’s that time of year again. All the leaves have fallen and winter is just around the corner. Those cold fronts are moving in and the snow is coming with them. As beautiful as snow is, nothing is more frustrating or backbreaking than grabbing the shovel and trying to clear a path between you and everything else. As someone who has spent several winters trying to clear the way so I could get to school and work, a snow blower is a must-have machine if you live in an area that sees significant snowfall each year. But, a snow blower is not just a luxery purchase. Danger lurks in snow and ice. Thousands of people are hurt each year from falling near their homes due to snow and ice. A snow blower will prevent the dangers of winter on your driveway, walkways, sidewalks, and patios or decks. Finding the best snow blower can be difficult, but you’ll find the best models here with an in-depth comparison so you can find the best one for your money. Which Snow Blower Do You Need? 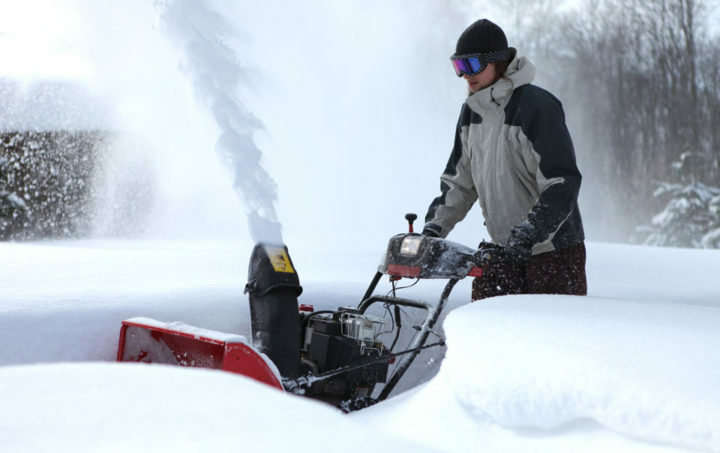 There are a few things to consider when looking at purchasing the best snow blower. With a variety of sizes, handling, and capabilities, no job is too big or too small for the right machine. 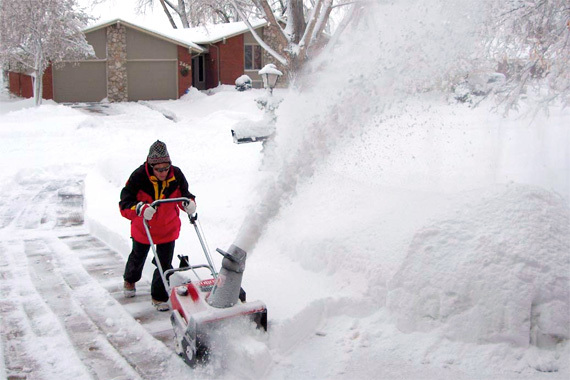 The best snow blower options on this list are for mostly residential use. If you happen to have an enormous driveway, having it plowed by a truck would probably work out better. But for most who live in towns and cities, these snow blowers will certainly do the job. 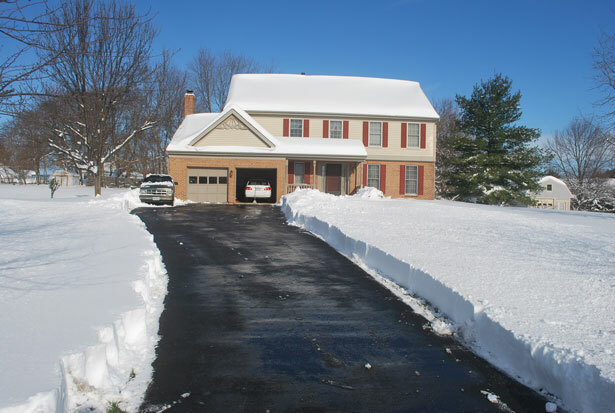 You can remove the snow from your driveway, sidewalk, patio, or other walkways in your yard. Before we jump into my review, be sure to read about the technical specifications of each product. Some of the products are made with different materials and will have other pros and cons. Make a list, if you must, to determine which product is best for you. This is especially important for older folks who may have trouble maneuvering some of this equipment. It is hard getting out there and shoveling, and while having a snow blower is easier, it can still be a workout. Luckily, there is something for everyone here. The Greenworks 20-Inch 13 Amp Corded Snow Thrower has big power in a small package. Greenworks is the number one brand of electric snow blowers in the United States. This best snow blower can move up to 500 pounds of snow per minute, so you won’t be wasting your time with this machine. You can get any job done quick, fast, and in a hurry for maximum efficiency. 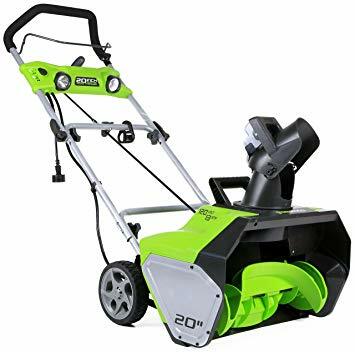 The Greenworks 20-Inch 13 Amp Corded Snow Thrower is a 13-amp little beast, perfect for driveways, walkways, and even decks and patios or other residential needs. 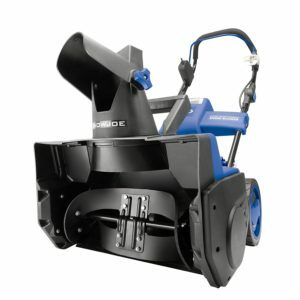 With 20 inches of clearance width and 10 inches of intake height, this snow blower can really move some snow quickly and is designed to prevent any clogging. Greenworks technology works to clean all the way down to the pavement surface so there’s no worrying you’ll have to go back over the same spot again and again. With its 180-degree adjustable chute, you can throw snow in many different directions with precision control and up to 20 feet depending on conditions. 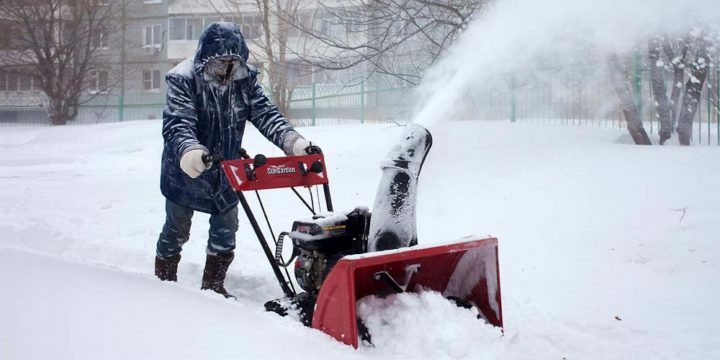 No need for gas with this electric snow blower. Just plug in and start moving that snow. The zip deflector easily and conveniently locks the chute into place so there’s not worry it will move while you’re clearing paths. The Greenworks 20-Inch 13 Amp Corded Snow Thrower features durable seven-inch wheels that provide great traction. The materials give it a lightweight, but sturdy construction at only 32 pounds. However, this snow blower is still heavy enough to move some serious snow. It is balanced for maximum maneuverability, efficiency, and perfect control. It has a comfortable ergonomic handle and a convenient quick chute handle. This handle adjusts the chute from side to side in case you need to change the trajectory of the snow as you go. The Greenworks 20-Inch 13 Amp Corded Snow Thrower is perfect for sidewalks or driveways that can park up to four cars but may not be a great choice for a larger job. 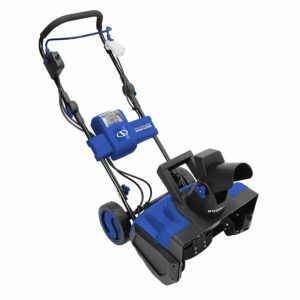 Given it is an electric snow blower, there is the hassle of the cord attached to you as you clear your paths, which could get in the way or be frustrating to work around. The Greenworks 20-Inch 13 Amp Corded Snow Thrower seems like the perfect residential snow blower. Unless you’re dealing with Alaskan winters, I think you’re safe to use this for any light to moderate snowfall that comes your way. I really love that it’s so lightweight which will make moving and storing really easy. Given the wider 20-inch width, sidewalks and other walkways probably won’t need more than one pass which is an awesome time saver. The ergonomic padded handle seems really comfortable especially for the cold weather where hands tend to stiffen up. The Snow Joe iON18SB is a beast. The Snow Joe can move up to 495 pounds of snow per minute, using two rubber blades on a steel auger to cut an 18-in-wide by 8-inch-deep path without damaging any surfaces. This baby will definitely clear any sidewalk, walkway, patio, or driveway you have. There’s no residential job too big for this best snow blower runner-up. 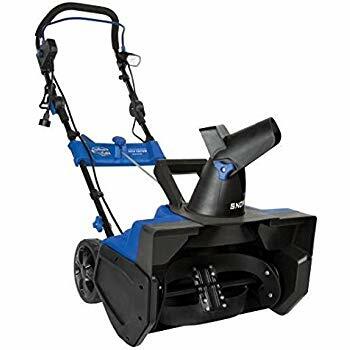 At the same time, it weighs in at only 32 pounds, making the Snow Joe a lightweight and versatile machine that’s easy to maneuver and stores away with no fuss. The 40-volt EcoSharp rechargeable lithium-ion battery in this model gives you 50 minutes of super quiet runtime so you don’t have any hassle with gas, cords, tune-ups or oil. No emissions and no extension cords needed. Just charge the Snow Joe up and get to moving that snow blocking your path. The Snow Joe features a 180-degree auto-rotate directional chute that can throw snow up to 20 feet away depending on conditions, making ease of use and providing precision control over where that snow goes. And if you’re job runs long; the Snow Joe features a 3-watt LED headlight for convenience when you need to do a little evening snow blowing. The battery is inserted right on the front of the model, making it simple and convenient to insert and change out. Lightweight construction weighing only 32 pounds for easy maneuvering and storage. The blades, though I’m sure are a sturdy rubber, are still only rubber. I don’t think it’s capable of handling any kind of partially frozen snow that would need to be cut through. The wheels on the back are plastic, lending to its lightweight construction. But, users have reported their inability to handle the terrain and would prefer a heavier duty wheel. The battery has the convenience of cord-free but the drawback of a time limit. If you’re trying to clear a few different areas, you may find yourself running out of battery life before you can finish. Most purchased a second battery and dual battery charger station to ensure they had a spare. I really love that it’s cordless, even with the possibility of running short on time. I can’t imagine the hassle of trying to cut through snow and make paths while dragging a cord around behind you. The clearance height on this is only 8 inches. I wish it was a little higher for better use in deeper snowfall. At 32 pounds, it’s still really lightweight which is great. But, I have my concerns about those plastic wheels on the back. I’m not sure they’ll be able to dig in when you need to. I think this would make a pretty great residential snow blower and is capable of handling lighter snowfall. I would avoid it in the northern states where there is a little more. I also think it’s great that it features a little headlight. In the early morning hours or late evenings, you may need to keep on clearing paths. The last thing you need to worry about is trying to hold a flashlight and push a machine or not have enough light to finish the job you started. Don’t let the Snow Joe SJ627E fool you. This little machine packs a punch. The Snow Joe SJ627E can throw up to 500 pounds of snow per minute out of your way, cutting a 22-inch path 13 inches deep as you go. When you use this snow blower, your pathways, sidewalks, and driveways are going to be clear of snow in no time at all. 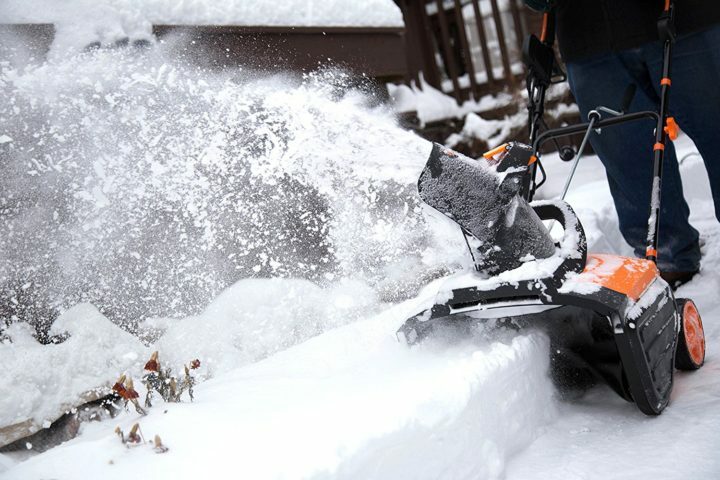 No need to fuss with the mess of gas or oil with this electric snow blower. Just plug it in and start going. Don’t let the snow be in control! The quick-adjust chute can be rotated 180 degrees to help you direct the path of the snow anywhere you want it to go. With an ability to throw it up to 20 feet (depending on conditions), this snow blower can get snow out of your way quickly and thoroughly. You shouldn’t have to go over any path over and again. Plus, the two powerful headlights allow the user to get work done in the wee hours of the morning. This little feature may seem small, but it is a powerful feature when clearing out the driveway and sidewalks or around the car at 6 am. The Snow Joe SJ627E has a lightweight construction at only 34 pounds for great handling and easy storage. The 15 Amp motor can tackle any light to moderate snowfall that comes your way. The Snow Joe SJ627E is a great option for any residential setting. At its lower price point, you’re really getting great value. It’s probably only optimal for light and less compact snow conditions. Although I’m sure the 15 Amp motor is powerful enough, it could leave something to be desired, possibly not able to handle the tougher jobs. It’s a little heavier than some other lightweight comparable models as well. Some users have reported it stopped working after very little use while others love their Snow Joe SJ627E, so it may be a question of specific conditions and frequency of use. I suggest you make absolutely sure you will be able to use this machine properly. If you get it on a good deal, then get it. Also, this model is not self-propelled, which can be a hassle for some. Although it is easy enough to move through the snow, it can be hard or maybe even impossible to tackle the larger snowfalls because of this. I think this would make a great snow blower if you’re looking for a less expensive option and you don’t get a lot of snowfall. It’s definitely not going to be ideal for the heavy and frequent snow you find in the northern states. If you only have a few small paths or small driveway, this could still be a great choice for your light residential needs. I really like the convenience of the quick adjust lever for the chute and the larger 180-degree rotation the chute has. I think you’re getting a great deal of value here for the price. Whether you’re in need of a heavy-duty snow blower for your larger spaces or want to spend less money on a smaller snow blower for your small paths, there’s a snow blower out there for you. When the snow sets in, don’t grab a shovel and break your back to move all that out of your way. A snow blower is a great investment for anyone who wants to handle their snow removal efforts themselves. With the convenient features offered, like electric, battery powered, fully adjustable and ergonomic features, a snow blower is going to save you so much time compared to a shovel. Cut your removal time way down and get back inside to the warmth or on your way to work so the snow doesn’t control you. It will save you money in the long run as an investment. You don’t have to rely on calling in a third party to handle your needs. Hopefully, you’ll find the best snow blower for your specific needs. 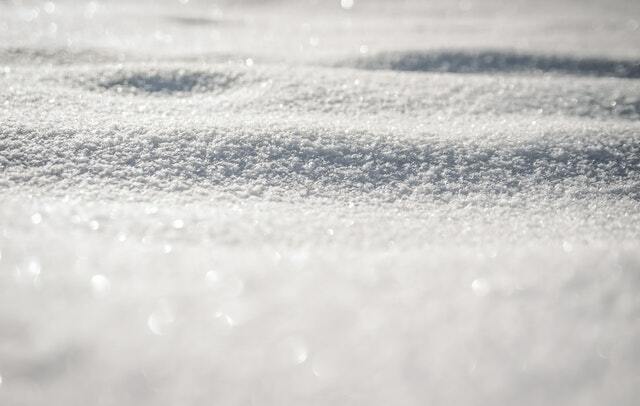 You’ll be able to enjoy more of your winter with less snow removal hassle than ever before. Trust me when I say, investing in a snow blower is the way to go. If you’ve ever had the backaches that come with bending over with those heavy loads of snow on your unsteady plastic shovel, you’ll believe in this investment too. Everyone needs hot coffee or hot tea before tackling a cold project like snow removal. Click here to find the best coffee grinders. Then, click here to search for the best coffee and tea kettles. You’ll also want to warm up by the fire when you’re done with the job. Click here to shop for the best fireplaces for any home.